Update: I bought a cheaper and better lapel mic - Speedlink Spes Clip-On. I like it more. I have this small compact camera which I use for most of my videos and I realized I could use a separate sound capturing gadget. 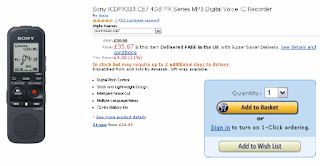 So, since the cam doesn't have a microphone input (apart from the built in stereo mike), I decided to go with the Sony ICD PX 333 digital voice recorder which, at the time of the purchase, was the bestselling device in its category (voice recorders) on Amazon.co.uk. I matched it with the Olympus ME-52W Noise Canceling Lapel Microphone for the simple fact that it's a directional mike (unlike omnidirectional mikes that capture more background noise). By the way, check out this review made by an Amazon customer. The guy is very knowledgeable and explains stuff like sensitivity, recording mono on two channels, the capture loop of the mic, etc. I'm not much of a technical dude so I'm just gonna point you to the the best instructions I could find on the web: Sony-Asia.com. The mic jack is mono so when you playback your clips, the sound will only come trough the left channel (speaker or headphone). But you can easily fix that in most video/sound editing software. Or you can buy a mono to stereo adapter and get the mono signal on both channels. This is how I do it in Magix Movie Edit Pro Plus (see the pictures below). After you import the audio, right click on the track and load the audio effects window. Then you select Stereo Wide. This splits the signal and distributes half of it (roughly) into the right channel. So what you get is sort of stereo but not really because the signals are slightly different in each channel with genuine stereo recordings. What you really get is a mono recording on both channels, meaning the signal is identical on each channel (left and right) - and that's exactly what you need with a voice recorder. There's no need for authentic stereo. If you're looking to better understand the difference between mono and stereo, have a look at these two videos below. They mention Audacity which is a free sound editing software that lots of pod-casters use. You can store files in different folders. Example: School recordings in Folder 01, job recordings in Folder 02, etc. The ability to pause a recording. You can resume the recording by pressing the Rec button again and there will be no noticeable gap in the recording. You can add track marks (bookmarks) on the recordings just by pressing the T-Mark button. Example: Say your interviewee said something ridiculous. You just press the T-Mark button and you'll be able to easily find that ridiculous remark later by using the supplied software. VOR feature - the device starts recording onece it picks up sound and pauses when there's no sound. Pretty cool, huh? It's a Mono recorder. However, you can transform the mono signal to stereo in post production if you want. No Micro SD card supplied. But with the built-in 4GB memory I think you won't need a card. Sound quality is lower than the built in mic of the recorder. It creates more background noise than the built in mic (you need to do sound cleaning to get rid of it). Mono jack creates extra workload in post production (you must buy an adapter in order to record sound on both channels). If you're a reporter or secretary I bet you'll love this. It's handy to use in meetings or interviews. For me though, it's an affordable add on to my videography and I'll be using it to capture sound when the subject is too far away from the camera. It's also very simple to use. But in order to reach higher quality you need to edit the sound in post production. If you're at an event you can plug it into the mixer using the Audio In mode. This way, you bypass all its limitations and capture the sound from the pro gear that the guys at the event use. Anyway, this is a cheap setup so I totally recommend it if you're an amateur filmmaker like me. Get it on BHPhotoVideo.com, Amazon Canada and Amazon Germany as well. I've been researching the features of a few different recorders, including this one. It appears that the mic jack is actually stereo, and stereo recording can be accomplished using an external mic and the two highest recording-quality settings. It's odd that so much on the spec sheet, however, emphasizes mono. Maybe the emphasis meant to clarify most people's experience, using the built-in mic. For your readers who do ambient, environmental or other special recording, the stereo capacity may be another feature that makes the PX333 a good choice. If I get one, I can try it out and write back with actual results! Thanks for providing such a comprehensive site! Hi Vince! Makes sense. The in jack is stereo but the built in mic is mono. The Olympus mic that I used with Sony had a mono jack... and so I only had sound in the left channel. :) That's why I dad to split the sound in post production and make it two channel (not actually stereo which is a different thing).